I follow Linda down the slope around 120 feet. Dive Journal: John has decided not to do the first dive this morning, and so we ask Michael to take us to Black Coral Canyon. This is a deep dive unsuitable for John, but Janel and Linda and I would love to see it. George says he will stay on top of the reef wall as well while the rest of us go deeper. The dive starts over sand flats and there are great fields of swaying garden eels. I find a pretty goldentail moray on the way to the wall. We finally locate a groove in the wall and follow it down and down to an overhang cut. Under the overhang, there are black corals, interesting sponge formations, and corkscrew growths. A sandy bottom slopes down and away from the cut at a 45° angle and we can see that it is easy to go too deep here if not watching the gauges carefully. As we examine the wall, I can feel the first solid dose of nitrogen narcosis I’ve ever felt. It is difficult to describe the sensation, almost that my thinking becomes viscous in a slightly pleasant sort of way. I recognize the effect right away and keep a special eye on the divers around me and my gauges. While we’re at depth, I see Linda’s tank strap slip and her tank sags to the base of her back! Michael, however, quickly takes care of the problem and we continue our swim up the reef wall and away from the cut. At about 95 feet, George joins us for the swim – I thought he was going to stay shallow! 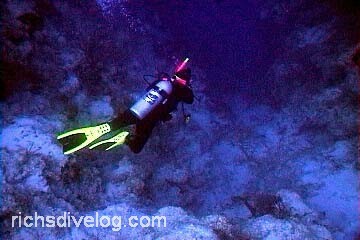 There are lots of sandy flats on top of the reef here, and we have fun exploring in the nooks of different coral stands. There is a big tiger grouper (always good for a photo or two), and a picturesque group of juvenile yellow fishes (some kind of wrasse I think) around vibrant coral growth. All three of us set personal depth records on this dive.